where $\alpha_k$ is the log hazard ratio for the $k$th cause for a one-unit increase in the biomarker, at time $t$. Each competing event can be modelled however we like, with different baseline hazard functions, and with different covariate effects. Of course, we can also have different or additional association structures for each event. 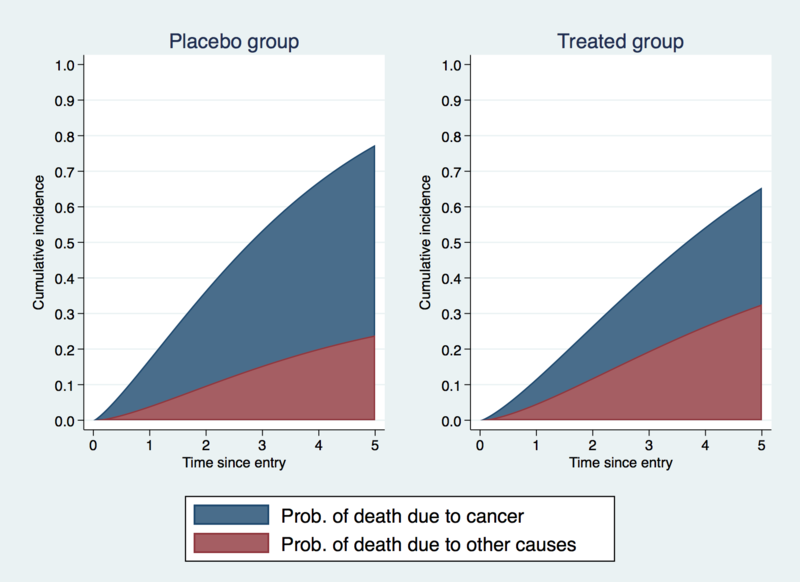 To illustrate, I’m going to show you how to simulate data from a joint longitudinal and competing risks model, with two competing risks, representing death from cancer and death from other causes, and then show how to fit the true model using merlin. Let’s assume a simple random intercept and random linear trend for the biomarker trajectory, i.e. We start by setting a seed, as always, and generate a sample of 300 patients and create an id variable. Next we generate our subject-specific random effects, for the intercept and slope. We need a single draw from each distribution, per patient. I’m assuming the random effects are independent, but that’s easily adapted using drawnorm. I also generate a treatment group indicator, assigning to each arm with 50% probability. Now we simulate cause-specific event times, using survsim. Simulating joint longitudinal-survival data is not the easiest of tasks mathematically, but thanks to survsim it’s pretty simple. We simply specify our cause-specific hazard function, and survsim does the hard work (numerical integration nested within root-finding), details in Crowther and Lambert (2013). which simulates our event times and stores them in t1, and censoring indicator in d1 given administrative censoring at 5 years. and we’re all done with the competing risk outcomes. Now onto our biomarker. Let’s assume a setting where our biomarker is recorded at baseline, and then annually, so each patient can have up to five measurements. The easiest thing to do is to expand our dataset, by creating replicants of each row, and then drop any observations which occur after each patient’s event/censoring time. row of data per patient, so we replace the repeated event times and event indicators with missings. which I would say is rather elegantly simple to specify for such a complex model…you may disagree. I’m using the EV[y] element type to link the current value of the biomarker to each cause-specific hazard model, making sure to specify the timevar() options, so time is correctly handled. This is also why we must use the fp() element type to specify functions of time (or rcs() if you prefer splines). We can use stime as our outcome in both survival models but simply use the cause-specific event indicators so we get the correct contributions to the likelihood. fp()#M2[id] |          1          .        .       .            .           .
M1[id] |          1          .        .       .            .           .
Now we have our fitted model, generally of most interest within a competing risks analysis is both the cause-specific hazard ratios, which we get from our results table, and estimates of the cause-specific cumulative incidence functions. We use merlin’s predict engine to help us with such things. When predicting something which depends on time, it’s often much easier to specify a timevar(), which contains timepoints at which to predict at, which subsequently makes plotting much easier. Let’s now predict each cause-specific cumulative incidence function, in particular, I’ll predict marginal CIFs, so we can interpret them as population-average predictions. I’ll also use the at() option so we can investigate the effect of treatment. 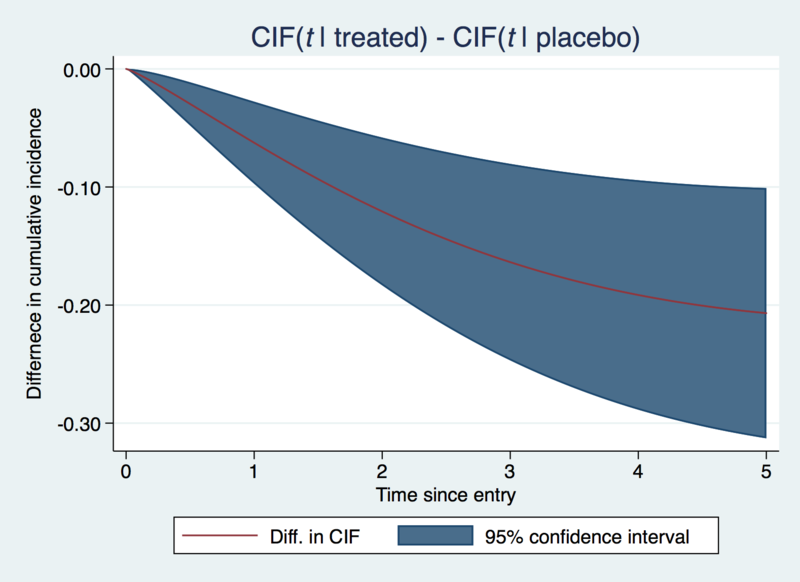 For plotting purposes, we often create stacked plots of CIFs, and one way to do this is to add them appropriately together to draw the area under the curve, and then overlay one of the CIFs..
We could directly quantify the impact of treatment on each CIF by predicting the difference. To get confidence intervals, we use Stata’s powerful predictnl command, which takes a bit of time, but gives us something really useful. So the joint model I’ve talked about is an introductory example in the competing risks setting. Given merlin’s capabilities, it’s rather simple to extend to using other associations structures, as such the rate of change (dEV[y]) or the integral (iEV[y]) of the trajectory function, and to use different distributions for each cause-specific hazard model…the list of extensions goes on.